My daughter’s second grade teacher approached me several months ago wondering if I could help the kids create felt bird nests to go with a math game they were learning. Though I had never attempted a nest, anything is possible with felt, and I never turn down an opportunity to spread the gospel of felt with children. 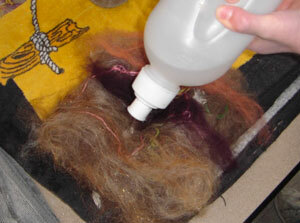 We started by laying out a couple of small batts in the traditional method with four crisscrossed layers. 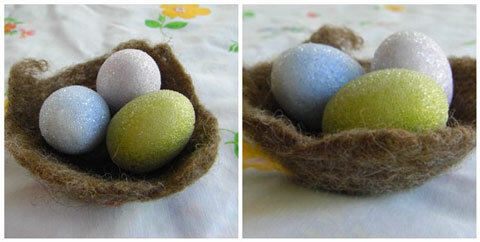 Since birds love to add soft things to their nests, we also added bits of thread, yarn and fronds of pampas grass. The small bowls were used as both a mold and vehicle to contain the water. Once the batts were complete, they were placed over the bowl where we squirted a small amount of hot water into the center. The small batts naturally bowed with the weight of the water, creating an indentation. 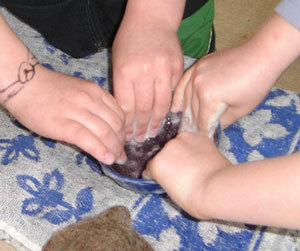 With soapy hands, we gently worked around the edge of the bowl pressing fingers to the sides to spread the moisture and soap. 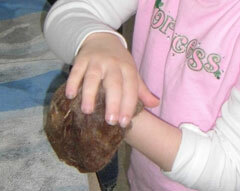 This was tricky for several children who found the wool sticking to their fingers. An extra set of more experienced hands was enough to get the process underway without tearing the batt to pieces. When the felt was evenly moistened, we pulled the piece out and placed it on the outside of the bowl as it was easier to work with a convex shape. 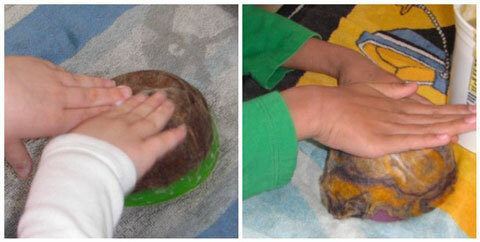 We patted and rubbed the bowl for a couple of minutes until the felt started to feel solid. 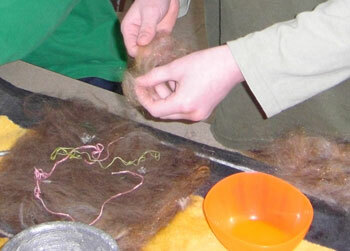 The last bit of felting was done on our fists because we could work it from the inside and out. Everyone was delighted with their finished product. There was a lot of variety in size, shape and color, much as you find in the wild. We worked with a mixture of Jacob roving, carded merino roving from Copperpot and a miscellaneous dyed wool blend from New Zealand I bought at my local fiber store. 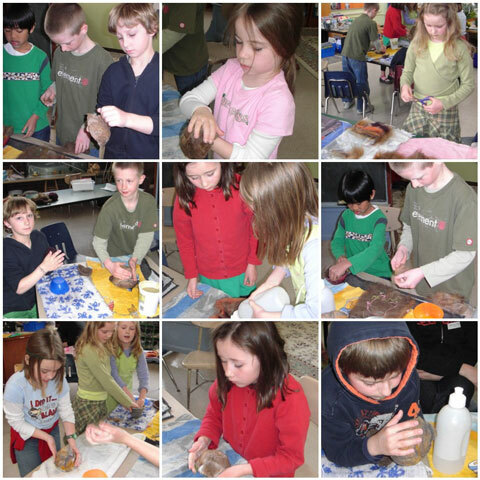 From the top left: Jacob and Sean work next to Dominic felting over his fist; Zoe finishes her nest on her fist; Madeleine cuts strands of yarn to layer in her batt, Dominic and Sean work with two different sized forms; Sophie pours water on Sophia’s batt, Jacob felts while Sean lays out his batt; Marlene felts her bowl while Madeleine and Sophie work together to moisten a batt; Sophia works around her bowl; Louis finishes his bowl on his fist. I made a felted nest last weekend but skipped the bowl and just did it with my fist. It came out pretty well. The bird, however, was a little bit odd! Side note: I have one felting book where she puts cotton cloth over the wool and gets that wet and works the felt that way to bypass that sticky wool phase. I wonder if that would help small hands who aren’t used to it? Gorgeous nests! That looks like a great project for kids. wonderful!! we’ll have to give it a try. thanks! yay! felted nests were our easter theme this year.. i felted them on a balloon, spritzed on the water, massaged with a plastic bag, then hand moulded to finish.. looks like you had *so* much fun with the children! What a fun craft. Thanks for sharing. And I recognize those IKEA bowls…very useful! Thank you for this post! 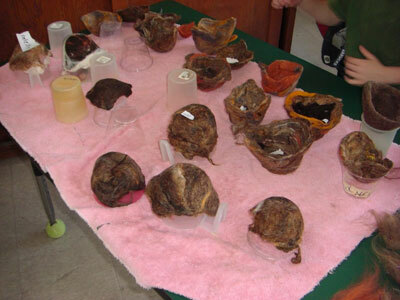 I wanted to make a felted bird’s nest as part of an art piece but really had no idea to go about it. A little Googling led me here and your instructions were great. My nest – made from my cat’s fur, tee hee – looks great. Thanks again! Very cool! About how much roving/wool did you purchase for this? I am thinking about doing this with a class of about 15. Thanks! this is great! i’ve never felted before so this was a perfect project. thanks for the post it was very useful.